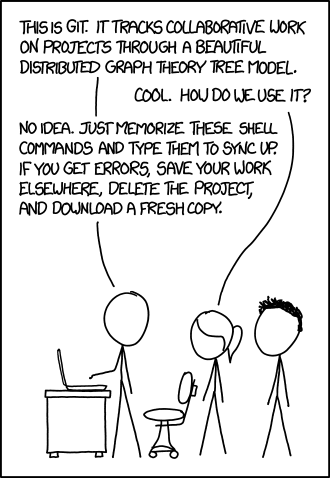 A few years ago I helped a development team switch from SVN to Git. I was responsible for converting over 100 repositories to Git, establishing a workflow, and training the team. The first two were actually the easiest. The Shrek blog post and svn2git helped convert the repositories and for 99% of projects GitHub flow (or master/feature) is the workflow to follow. The third task - training the team on Git - proved to be the most challenging. Not because there's such a steep learning curve, but because everyone was using a different tool. I found teaching developers to use Git from the command line provided a strong foundation. The developers then applied this understanding to their own tool. These developers became empowered by Git. I realized although Git is a tool most developers use everyday, it's the one we know the least. I have been on a journey to empower more developers - by training, writing posts, speaking at conferences, recoding videos, and now hosting an online workshop. I provided the backstory because it's important to understand this is not something I am just doing. There was a long road that lead me here. An online workshop requires a format, schedule, and attendees. I'd like to share the plan for my own workshop not only for feedback, but breadcrumbs for anyone else thinking of hosting an online workshop. A few months ago I spoke at Laracon Online. It was my first virtual conference as both an attendee and speaker. I was pretty impressed. I felt their format worked. I reached out to the organizer to see if he felt the same. He did. So why change a good thing? I adopted their format and will use Zoom to stream live to attendees and Slack for attendees to communicate. Since I have lead Git workshops at conferences I had a rough schedule. I adapted it slightly for a virtual workshop - adding more breaks and designated time for questions. The workshop would be four 1 hour sessions followed by 15 minutes for questions and a 15 minute break. During which time attendees can mingle in Slack. This also gives me an opportunity to answer any remaining questions in Slack and prepare for the next session. Take a minute to view the full schedule. This is the hard part. It's not as easy as if you build it the will come. Initially my goal was 100 attendees. I emailed attendees for my previous workshops talks and video subscribers. I barely made it half way to my goal. I considered cancelling the workshop. Then I thought maybe this first one will be small, but it's something I can grow over time. After all, developers are continually learning Git. So if you're learning Git or want to improve your understanding I hope to see you virtually on July 19th for the first "Getting Git" Online Workshop. Or if you're considering hosting your own online workshop feel free to send me your questions. &LeftArrow; You changed the code, you didn't refactor the code.